Sometimes you just need something warming for dinner. 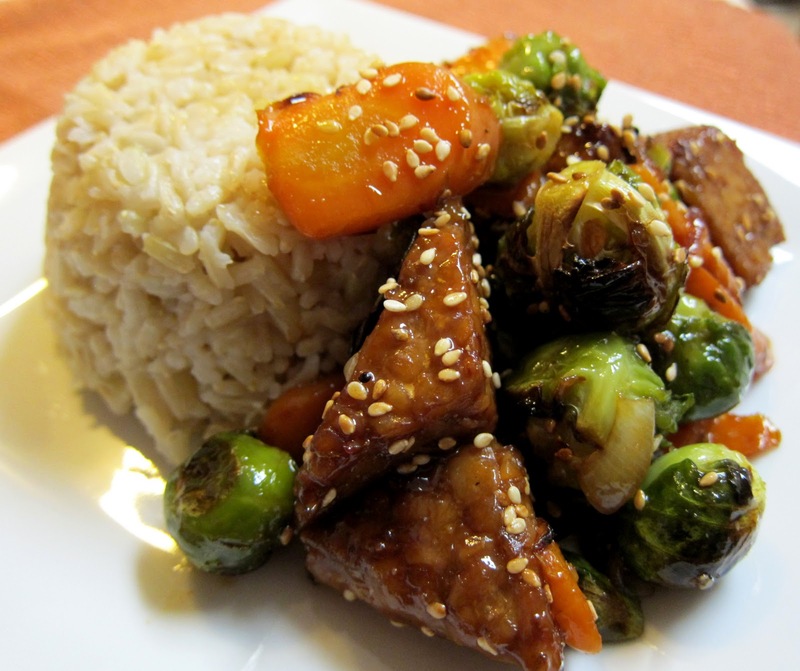 A nice big pile of veggies and protein with some rice in the form of a curry, stew, or maybe a stirfry. My friend and coworker Gabrielle is genious at creating such vegetarian dishes, and often does for the hot food bar we have at the deli we work in. I will ask her what she is making and she will simply smile and say "slop". Delicious slop it is, and far from slop, as her stir fries and tofu dishes are always beautiful and full of brightly colored vegetables...the slop refers to the mound of food I guess. So yesterday I decided that I needed some slop, and I threw together a quasi Asian dish inspired by her. She makes a tempeh dish with roasted brussels sprouts and tempeh with sauteed carrots, kale and onions that is amazing. It contains lots of garlic, ginger and mirin, and always smells wonderful! And so, since I don't have her recipe, I made my own version, which turned out beautifully! Below I have included the finished dish if you would like some delicious slop as well! Preheat the oven to 475 degrees. Line 2 baking sheets with foil, and spray with non-stick spray. Toss brussels sprouts and carrots with just enough peanut oil to coat, and spread out on one of the sheets. Roast until tender and starting to brown, about 15-20 minutes. Meanwhile, toss the tempeh with 2 Tbsp tamari and 1 Tbsp peanut oil and spread out on the other sheet. Bake until starting to brown at edges, about 15 minutes. Meanwhile, when the veggies and tempeh are almost through roasting, heat 1 Tbsp peanut oil in a large non-stick skillet over medium heat. Add onions, and ginger and saute until onions are starting to become translucent, about 5 minutes. Add garlic, and sautee until fragrant, about 1 minute, then add roasted veggies and tempeh. Whisk together mirin, orange juice, sesame oil, tamari, and cornstarch, and add to the pan. Stir, and cook until heated through. Add sea salt to taste, and toasted sesame seeds. Serve hot with rice! This looks delicious! 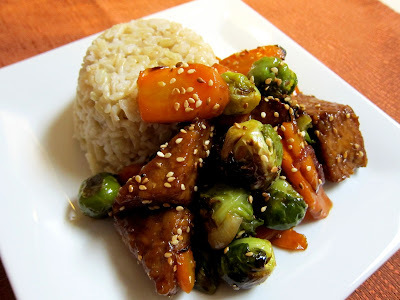 Never tried tempeh since I can't find it in any grocery store here but if I do, I'll definitely try this ;). I love Brussels sprouts :). I luv tempeh! And brussels sprouts too! All my fav stuff, looks YUM! What a fabulous meal! it sounds amazing! Oooo, that looks good. Good good good...I would have this plate cleaned in 3 minutes...and be asking for seconds. OK. I don't think I have ANY of the ingredients necessary to make this dish...but I'm gonna run out and get them NOW! Well, I probably have some of the staples, but not the tempeh (gasp! 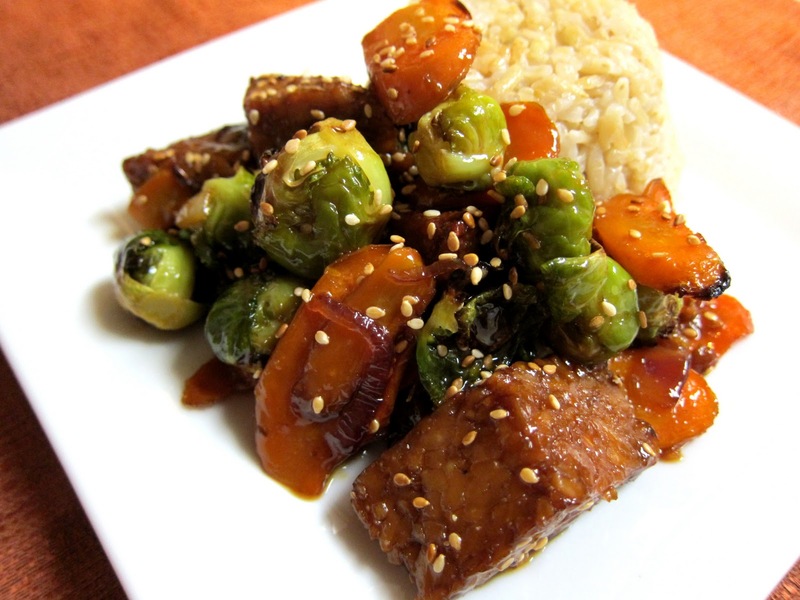 ), brussels sprouts (agghh) or sesame seeds (doh!!). This looks so good and after a week of more traditional vegan meals, I need this. Thanks SO much! Great recipe! 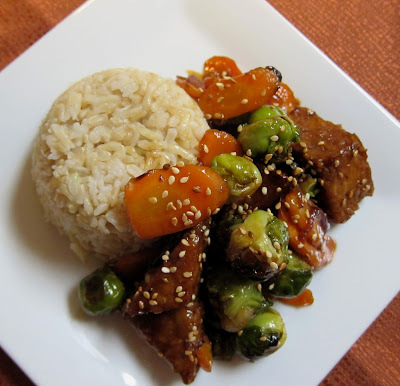 I am always looking for new new ways to use tempeh. This looks delicious! I love roasted brussels sprouts (my sister and I usually shave them, so that the caramelized flavor gets all the way through the sprout). Thanks for sharing!!! That dish looks so good. Tempeh has become one of my favorites. It took me such a long time to get over the sight of it, thinking the store was trying to sell something moldy and old. Once I began experimenting with it, I fell in love. So nutritious and so good.